Join the 2016 Disney ABC "Share the Joy" Holiday Campaign! Are you ready to "Share the Joy" of the holiday season? Disney|ABC certainly is! By teaming up with Feeding America and Toys for Tots, we hope to make the holidays a little brighter for those who need it most. Disney|ABC partners with Feeding America to support food banks, create access points within communities and provide children in need with nutritious meals. CHECK OUT A BRAND NEW "HAPPY HOLIDAYS" VIDEO FROM THE DISNEY|ABC TELEVISION GROUP! The Walt Disney Company also supports the U.S. Marine Corps Reserve Toys for Tots Foundation as a way to connect with children and families during the holiday season. See how you can help in the video below! The Disney ABC relationship with Toys for Tots began in 1948 when Walt Disney and his animators personally designed the original Toys for Tots train logo that is still used today. Every year, Disney and Disney|ABC Television Group (DATG) join the hundreds of communities across the country to collect new, unwrapped toys during October, November and December, and distribute those toys as Christmas gifts to needy children in the community. Share the joy with those who need it most. Donate an unwrapped toy to a deserving family at a Toys for Tots location near you or donate online right here! AFV's ALFONSO RIBEIRO AND SOME SPECIAL GUESTS TALK TOYS FOR TOTS! As part of the "Share the Joy" holiday campaign, Disney, ABC and Feeding America have teamed up to inspire healthier generations by expanding access to fresh produce and nutritious foods in communities where kids and families need it most. 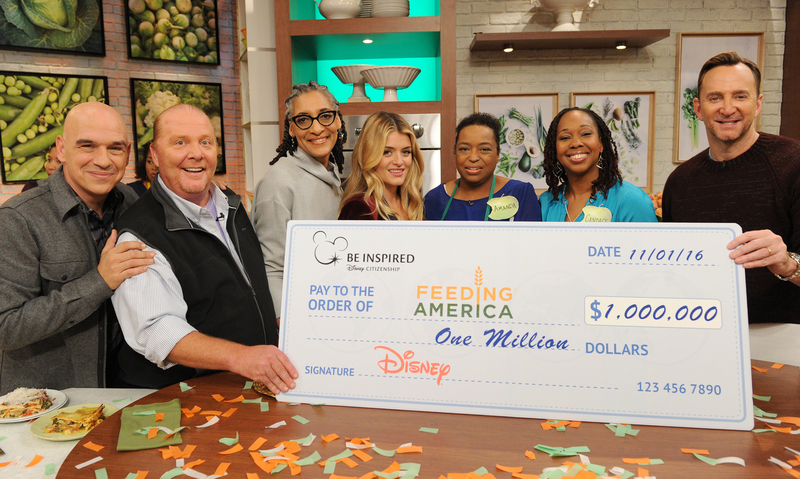 Disney has announced a $1 million Feeding America donation to help strengthen communities. Increasing the access kids have to nutritious foods and engaging audiences to take action is a part of The Walt Disney Company's long-standing commitment to making healthy lifestyles accessible, simple, and fun for families. Disney ABC's "Share the Joy" helps provide a helping hand and much-needed food to families facing hunger. To get involved, donate to Feeding America right here, right now! If you have a busy holiday season and think you may not have time to give back, Disney|ABC has another option for you. You can adopt-a-child in need online! Without stepping foot into a mall or toy store, you can grant a foster child's holiday wish through One Simple Wish right here! There's no need to wrap the gifts for Toys for Tots which will certainly help avoid situations like the one Modern Family's Mitch and Cam encounter in the below clip.